What do you make when you have been on the road for 10 days, you need something healthy and the fridge is bare? This is when I turn to my pantry and canned goods. Farro is a wonderfully nutty option over rice, it's similar to barley with a little firmer texture. Now, a lot of people would scoff at the use of the canned beans, but they are great in a pinch! I keep them on hand at all times for their ease. But if you have the time for the overnight soaking of dried beans, do it! It will yield a slightly better bean. The cherry vinaigrette really makes the difference here. 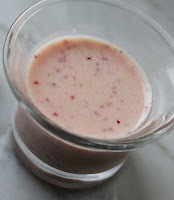 By blending the cherries, you will have a pink dressing with little pieces of cherry that permeate the salad, imparting wonderful bites of sweetness. I do suggest soaking them first to plump them up a bit. Next time you're in a crunch for dinner, look to your pantry and see if you can't come up with a fat and happy meal! 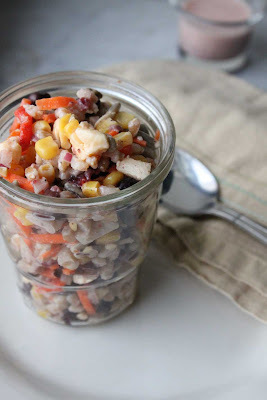 Tips and Techniques: Substitute barley or rice if you don't have Farro. 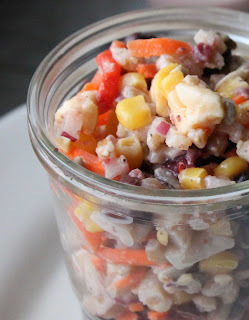 This salad comes together super easy. It can be the main dish, or a side to supplement meat or fish. Store it in the fridge for up to 4 days, but serve it at room temperature for the best flavor. Begin by soaking the cherries in the grapeseed oil for at least 15 minutes, set aside. Cook the farro according to package directions. In the meantime, place the black beans, corn, carrot, red onion and water chestnuts in a bowl. Add the farro, sunflower seeds and the crumbled cheddar and lightly toss. Mix the vinaigrette- place the cherries and oil in the blender, add the red wine vinegar, mustard and salt and pepper. Blend on high for one minute. Pour half of the vinaigrette over the salad ingredients and toss; adding more vinaigrette only as needed. Add salt and pepper as needed for taste. The cherries will be chopped into tiny pieces and will offer little sweet bites to the salad- simply delicious.